For a 4 and 6-year-old, my kids are not what I would classify as “picky eaters”. They don’t like spicy food, trying new things is always a challenge, and 90% of the time they tell me they’d prefer cereal to whatever it is I’m cooking. 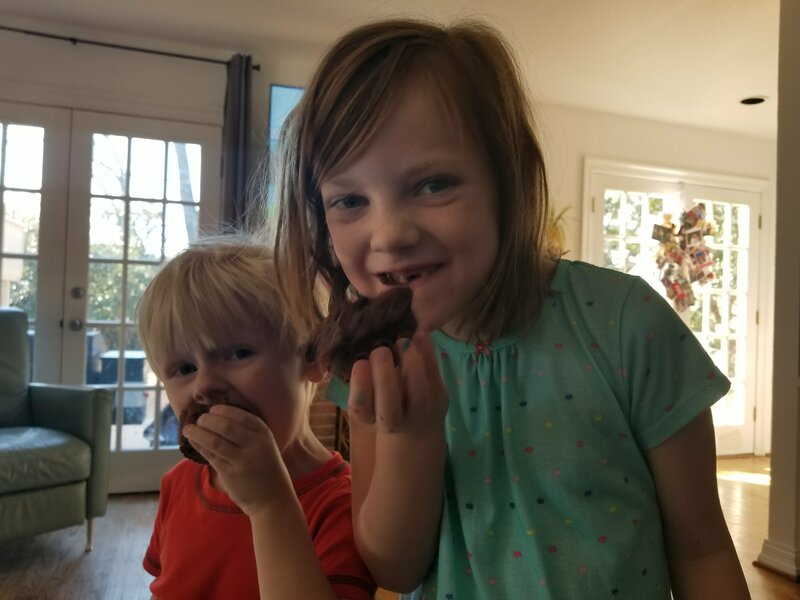 But my 6-year-old can inhale spring rolls and sushi at an alarming (and expensive) rate, my 4-year-old’s favorite snack is a Cliff bar, they both love fruit, drinking lots of water, and mostly understand that you don’t get a sweet treat unless you’ve eaten some “real food”. Overly healthified, as in, there’s no way my kids would eat them. Full of sugar and vegetable oil, which kind of negates the health benefits we’re seeking. Essentially, a chocolate zucchini cupcake. These are the Goldilocks of muffins for me – not overly sweet, so you feel like you made a healthy choice, but sweet enough that you feel like you’re getting a treat. Win/win. Preheat to 350°. Grate the zucchini (no need to peel) on a box grater. Place the shredded zucchini into a colander and press on the top with paper towels to soak up excess moisture. Stir together flour, cocoa powder, baking powder, baking soda, salt, and cinnamon. Melt the butter or coconut oil and whisk in the sugar (it’s not much, I do it in a Pyrex measuring cup). Whisk the eggs into the sugar/butter mixture and fold in the sour cream/yogurt. Pour the wet ingredients into the dry ingredients and stir until combined. At this point, the batter will seem overly dry, but then add the grated zucchini and the remaining moisture will loosen things up. Stir until combined, then fold in the chocolate chips. Grease a muffin tin and fill with batter 3/4 full. I usually yield between 16 and 18 muffins. Bake for about 20 minutes, or until a toothpick in the middle comes out clean. Until Robin started kindergarten last fall, I never really understood the allure of 30-minute meals. Before then we lived with my parents and I stayed home with my two pre-schoolers. By dinnertime, I was so excited to do something other than play Barbies or watch another round of Octonauts, I had 3 other adults (a dad and 2 grandparents) who were stoked to play with the kids, my dad loves cooking as much as I do so we worked together, and my mom always did the dishes. I never minded spending an hour cooking dinner with my dad with no impending clean up – and, as much as I love being a stay-at-home-mom, it was often the highlight of my day. Of course, seasons change. We now live 28 whole minutes away from my parents, Robin’s in kindergarten all day, I’m only cooking for two adults, the kids have evening activities that make dinner complicated, and though I require everyone to do their part, I end up with the bulk of the dishes, too. While we were adjusting, we ended up picking up a lot of takeout, which was so great when we were 23, but at 33 your body just doesn’t handle Taco Bell like it used to. So here we are, renewed interest in 30-minute meals. On Wednesday nights, Robin has a Daisy Troop meeting that lasts an hour 5 minutes from our house starting at 6. Eating at 5:30 is too early, and 7:30 is too late, but by the time I’ve dropped her off, chatted with the moms, and driven home, I’ve only got 40-minutes max to cook and eat before I have to leave to pick her up. My 6-year-old does not handle late pickups well. Enter Kimchi Noodles – which can be cooked, start to finish, and eaten by me, a notoriously slow eater, in 40 minutes. If you love kimchi, noodles, and runny eggs, this meal is for you. As much as I like to brag about my kids loving a wide variety of foods, this dish is spicy and I won’t subject my kids to fermented vegetables yet, so they get macaroni and cheese at 5:30. Kimchi, gochujang, and udon noodles can be a bit hard to find, but they last forever, so stock up and you can bust this out when all you’ve got is eggs to work with. 1 cup or so of kimchi (I use Mother-In-Law Kimchi – which is absolutely the best I’ve had and I use about half a jar) and some of the kimchi juice. 2-3 T gochujang paste, depending on how spicy you want to go. optional: broccoli, green onions, and/or sesame seeds – but it’s fine without any of those. Start the water boiling for the noodles and cook according to package directions (usually about 4 minutes. In a large skillet or dutch oven, melt 2T of the butter over high heat and roughly chop the kimchi. When the butter starts to sizzle, add the kimchi and gochujang and stir everything together. If you’re using broccoli, add it here and cook with the kimchi mixture for about 5 minutes until nice and caramelized. Turn the heat down a little, add the broth and whatever leftover kimchi juice you have to the kimchi to deglaze the pan. Continue cooking until the noodles are done. Drain the noodles and add them to the kimchi mixture and stir and cook it all together while you do the eggs. In a small frying pan, melt a pat of butter over high heat, then crack in the egg and cook until the edges are set (around a minute). 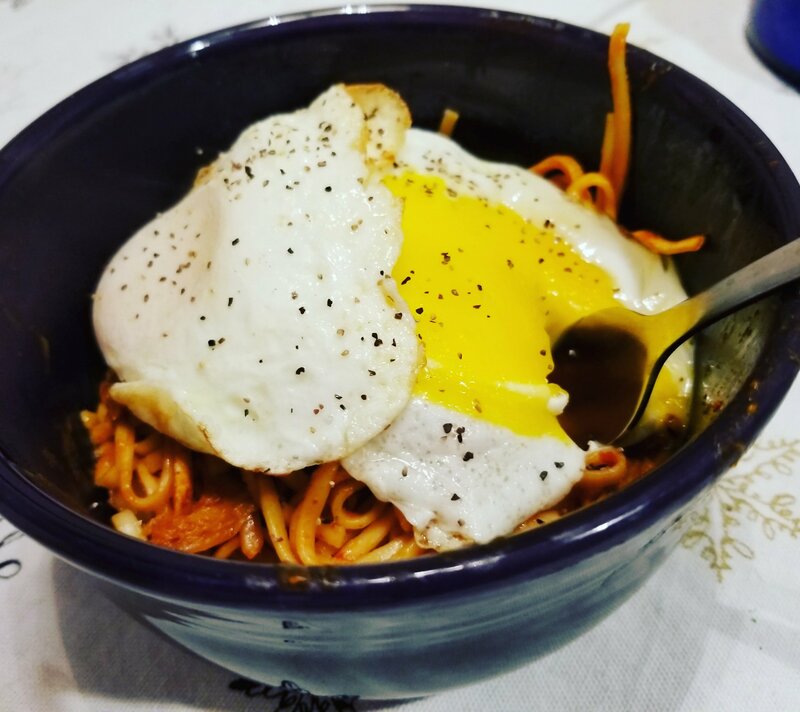 Flip the egg and count to 10, then serve over the noodles (my husband likes 2 eggs, I usually only like one). Garnish with some sliced green onions or sesame seeds if you’ve got them.